We see you're using an iPad and we've got great news for you! 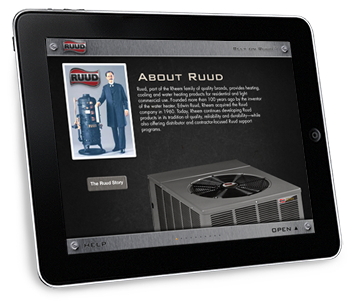 Rheem is excited to introduce our iPad Application and give you the opportunity to download it now for free. If you would like to download the Rheem iPad Application, click the download button below and then login to MyRheem. After you login you will be presented with further instructions. Please enter your MyRheem username and password below. The download page will appear once we've verified your credentials. 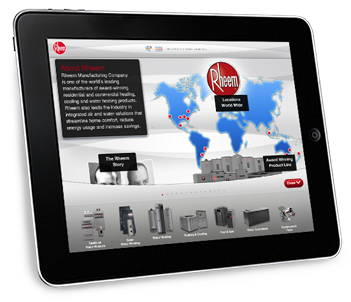 Welcome to Rheem iPad App. The Rheem iPad App program (the “Program”) is provided to you by Rheem Manufacturing Company (“Rheem”) solely for the purpose of providing information about product models provided by Rheem and its affiliated entities and to allow you to generate documents and other materials that can be used to submit proposals to third parties. This Program is intended for use by professionals properly trained and licensed (where required) in the installation of the Rheem products. By using this Program, you represent that you are a professional who is properly trained and licensed (where required) in the installation of the Rheem products. Except as otherwise set forth herein or agreed to between you and Rheem, these terms and conditions (“Terms and Conditions”) govern your use of the Program. By accessing and using the Program, you acknowledge that you have read and unconditionally agree to follow and be bound by these Terms and Conditions. If you do not agree to be bound by these Terms and Conditions, then you are requested to immediately exit this website and cease all use of the Program or any documents generated therefrom. Please refer to these Terms and Conditions regularly. Rheem reserves the right, at any time, to modify, amend, alter, or update these Terms and Conditions without prior notice to you by updating this posting. Your continued use of the Program following posting of changes to these Terms and Conditions signifies that you agree to be bound by such modifications, amendments, alterations, or updates. Rheem grants you a limited, revocable, non-exclusive license to use the Program for your internal business operations. This license does not permit you to use the Program, the Content, or Rheem’s confidential or proprietary information to provide services to third parties (e.g., business process outsourcing or service bureau applications). You may not copy, translate, disassemble, or decompile, nor create or attempt to create, by reverse engineering or otherwise, the source code from the object code of the Program. You are not permitted to make any derivative works of the Program and ownership of any unauthorized derivative works will automatically become the sole and exclusive property of Rheem. Notwithstanding the foregoing, the Program may be used to generate Rheem product information and to provide such information to third parties. All content included in or generated by the Program, including, without limitation, all materials, documents, information, data, specifications, descriptions, images, graphics, trademarks, text, links, illustrations, designs, icons, photographs, the object code, the source code, and the HTML code (collectively the “Content”) is the property of Rheem, its affiliates or content providers of Rheem and is protected by copyright and trademark law. You may download or copy the Content for your use in accordance with these Terms and Conditions only so long as you keep intact all copyright and proprietary notices. No right, title, or interest in the Content, downloaded materials, or software is transferred to you as a result of any downloading or copying of the Content. Except as expressly authorized by these Terms and Conditions, you may not reproduce, publish, transmit, distribute, display, modify, create derivative works from, sell or participate in any sale of or exploit in any way, in whole or in part, any of the Content without the prior written consent of Rheem. It is strictly prohibited to modify, transmit, distribute, reuse, reverse engineer, repost, "frame" or use the Content without written permission from an authorized representative of Rheem. THE PROGRAM INCLUDES CONTENT AND INFORMATION THAT IS SUBJECT TO CHANGE WITHOUT NOTICE. WHILE RHEEM DESIRES THAT THE CONTENT AND INFORMATION AVAILABLE ON THE PROGRAM BE UP-TO-DATE AND ACCURATE, IT IS YOUR SOLE RESPONSIBILITY TO CONFIRM THE ACCURACY, COMPLETENESS OR RELIABILITY OF SUCH CONTENT AND INFORMATION. THE PROGRAM IS INTENDED SOLELY TO GIVE YOU INFORMATION RELATED TO RHEEM PRODUCTS, BUT IS NOT INTENDED TO BE A SUBSTITUTE FOR YOUR PROFESSIONAL JUDGMENT. ACCORDINGLY, RHEEM DOES NOT WARRANT OR MAKE ANY REPRESENTATION REGARDING THE USE OF THE CONTENT OR INFORMATION AVAILABLE ON THE PROGRAM OR THE ACCURACY OR RELIABILITY OF SUCH CONTENT OR INFORMATION. You are prohibited from violating or attempting to violate the security of the Program, including, without limitation, (a) accessing data not intended for such user or logging onto a server or an account which the user is not authorized to access; (b) attempting to probe, scan or test the vulnerability of a system or network or to breach security or authentication measures without proper authorization; (c) attempting to interfere with service to any user, host or network, including, without limitation, via means of submitting a virus to the Program, overloading, "flooding," "spamming," "mailbombing" or "crashing;"; or (d) forging any TCP/IP packet header or any part of the header information in any email or newsgroup posting. Violations of system or network security will result in the user being denied access to the Program and may result in civil or criminal liability. Rheem will use commercially reasonable efforts to investigate occurrences that may involve such violations and will cooperate with law enforcement authorities in prosecuting Program users who are involved in such violations. You agree not to use any device, software, or routine to interfere or attempt to interfere with the proper working of the Program or any activity being conducted on the Program. You agree not to use or attempt to use any engine, software, tool, agent or other device or mechanism (including without limitation browsers, spiders, robots, avatars, intelligent agents or similar devices) to navigate or search the Program. Any passwords used for the Program are only intended for individual use. You are prohibited from sharing or otherwise providing the right to use your password with any other person. You will be responsible for the security of your account and your password. Rheem may, in its sole discretion, monitor the use of any password and may require you to change your password at any time. Anything that you submit or post to the Program and/or provide Rheem in conjunction with your use of the Program, including without limitation, ideas, know-how, techniques, questions, answers, reviews, comments, and suggestions (collectively, "Submissions") is and will be treated as non-confidential and nonproprietary and will automatically become the sole and exclusive property of Rheem and may not be returned to you. You will not use false contact or log-in information or the information of any other person or entity, pretend to be someone other than yourself or otherwise mislead Rheem or third parties as to the origin of any Submissions. You agree not to post content that is illegal, obscene, threatening, defamatory, invasive of privacy, otherwise injurious to third parties. THE PROGRAM, INCLUDING, WITHOUT LIMITATION, ALL PRODUCTS, INFORMATION, CONTENT, AND SERVICES MADE AVAILABLE ON OR THROUGH THE PROGRAM, IS PROVIDED “AS IS.” RHEEM AND ITS AFFILIATES AND THEIR EMPLOYEES AND AGENTS MAKE NO REPRESENTATIONS OR WARRANTIES OF ANY KIND OR NATURE WHATSOEVER REGARDING THE CONTENT OR SERVICES OF THE PROGRAM. RHEEM AND ITS AFFILIATES AND THEIR EMPLOYEES AND AGENTS DISCLAIM ANY AND ALL EXPRESS OR IMPLIED CONDITIONS, REPRESENTATIONS, AND WARRANTIES, INCLUDING BUT NOT LIMITED TO WARRANTIES RELATED TO ANY COURSE OF DEALING, USAGE OR TRADE PRACTICE AND ANY IMPLIED WARRANTY OF MERCHANTABILITY, FITNESS FOR A PARTICULAR PURPOSE, TITLE OR NON-INFRINGEMENT. MOREOVER, RHEEM DOES NOT REPRESENT OR WARRANT THAT YOUR ACCESS TO AND USE OF THE PROGRAM WILL BE UNINTERRUPTED OR ERROR-FREE, THAT DEFECTS WILL BE CORRECTED, OR THAT THE PROGRAM AND MATERIAL ACCESSIBLE TO YOU ARE FREE OF VIRUSES OR OTHER HARMFUL COMPONENTS. NEITHER RHEEM NOR ITS AFFILIATES WILL BE LIABLE FOR ANY DIRECT, INDIRECT, INCIDENTAL, PUNITIVE, CONSEQUENTIAL, OR ANY OTHER DAMAGES WHATSOEVER THAT RESULT FROM THE USE OR PERFORMANCE OF, OR THE INABILITY TO USE, THE SITE, THE PRODUCTS, OR INFORMATION OR FUNCTIONS ON SUCH SITE, EVEN IF RHEEM HAS BEEN ADVISED OF THE POSSIBILITY OF SUCH DAMAGES. IN NO EVENT WILL RHEEM AND ITS AFFILIATES’ TOTAL LIABILITY TO YOU FOR ALL DAMAGES, LOSSES, AND CAUSES OF ACTION, WHETHER ARISING OUT OF CONTRACT, TORT OR OTHERWISE, EXCEED THE AMOUNT PAID BY YOU, IF ANY, FOR ACCESSING THE PROGRAM. In addition to any other legal or equitable remedies for misuse, Rheem may, without prior notice to you, immediately terminate these Terms and Conditions or revoke any or all of your rights granted under these Terms and Conditions. Upon any termination of these Terms and Conditions, you must immediately cease all access to and use of the Program and Rheem may, in addition to any other legal or equitable remedies, immediately revoke all password(s) and account identification issued to you and deny your access to and use of the Program in whole or in part. Any termination of these Terms and Conditions will not affect the respective rights and obligations (including without limitation, payment obligations) of the parties arising before the date of termination. You agree to defend, indemnify, and hold harmless Rheem and its affiliates from and against any and all claims, damages, costs, and expenses, including without limitation attorneys' fees, arising from or related to your use of the Program. The remedy of Rheem at law for any actual or threatened breach of these Terms and Conditions would be inadequate and Rheem will be entitled to specific performance or injunctive relief, or both, in addition to any damages that Rheem is legally entitled to recover, together with reasonable expenses of any form of dispute resolution, including, without limitation, attorneys' fees. No right or remedy of Rheem will be exclusive of any other, whether at law or in equity, including without limitation damages injunctive relief, attorneys' fees and expenses. No waiver by Rheem of its rights or remedies under these Terms and Conditions will imply any obligation to grant any similar, future, or other waiver. In making and performing these Terms and Conditions, the relationship between the parties is that of independent contractor and neither party will be deemed an agent, legal representative, joint venturer, or partner of the other party. You are not authorized to create or bind Rheem to any obligation, affirmation, or commitment with respect to any other person or entity. Except as expressly stated herein, nothing in these Terms and Conditions will confer any rights upon any person other than the parties hereto and their respective successors and permitted assigns. By using the Program, you agree that the laws of the state of Georgia, without regard to principles of conflict of laws, will govern these Terms and Conditions. Furthermore, you agree to submit to the venue and personal jurisdiction of the state and federal located in the state of Georgia for the resolution of any controversy or claim arising out of or relating to these Terms and Conditions or relating to use of the Program and you waive any objection to such jurisdiction on the grounds that it is an inconvenient forum or any similar grounds. Rheem specifically reserves all rights to limit provision of the Program to select persons, countries, or geographic regions. If any these provisions will be deemed invalid, void, or for any reason unenforceable, that condition will be deemed several and will not affect the validity and enforceability of any remaining provision. We have detected that your iPad operating system is out of date. Please connect your device to iTunes to update to the latest version. Once updated, you can return to MyRheem.com to download the app. If you're just trying to access MyRheem, click the button below and then login to MyRheem. We see you're using an iPad and we've got great news for you! Ruud is excited to introduce our iPad Application and give you the opportunity to download it now for free. If you would like to download the Ruud iPad Application, click the download button below and then login to MyRuud. After you login you will be presented with further instructions. Please enter your MyRuud username and password below. The download page will appear once we've verified your credentials. Welcome to Ruud iPad App. The Ruud iPad App program (the “Program”) is provided to you by Ruud Manufacturing Company (“Ruud”) solely for the purpose of providing information about product models provided by Ruud and its affiliated entities and to allow you to generate documents and other materials that can be used to submit proposals to third parties. This Program is intended for use by professionals properly trained and licensed (where required) in the installation of the Ruud products. By using this Program, you represent that you are a professional who is properly trained and licensed (where required) in the installation of the Ruud products. Except as otherwise set forth herein or agreed to between you and Ruud, these terms and conditions (“Terms and Conditions”) govern your use of the Program. By accessing and using the Program, you acknowledge that you have read and unconditionally agree to follow and be bound by these Terms and Conditions. If you do not agree to be bound by these Terms and Conditions, then you are requested to immediately exit this website and cease all use of the Program or any documents generated therefrom. Please refer to these Terms and Conditions regularly. Ruud reserves the right, at any time, to modify, amend, alter, or update these Terms and Conditions without prior notice to you by updating this posting. Your continued use of the Program following posting of changes to these Terms and Conditions signifies that you agree to be bound by such modifications, amendments, alterations, or updates. Ruud grants you a limited, revocable, non-exclusive license to use the Program for your internal business operations. This license does not permit you to use the Program, the Content, or Ruud’s confidential or proprietary information to provide services to third parties (e.g., business process outsourcing or service bureau applications). You may not copy, translate, disassemble, or decompile, nor create or attempt to create, by reverse engineering or otherwise, the source code from the object code of the Program. You are not permitted to make any derivative works of the Program and ownership of any unauthorized derivative works will automatically become the sole and exclusive property of Ruud. Notwithstanding the foregoing, the Program may be used to generate Ruud product information and to provide such information to third parties. All content included in or generated by the Program, including, without limitation, all materials, documents, information, data, specifications, descriptions, images, graphics, trademarks, text, links, illustrations, designs, icons, photographs, the object code, the source code, and the HTML code (collectively the “Content”) is the property of Ruud, its affiliates or content providers of Ruud and is protected by copyright and trademark law. You may download or copy the Content for your use in accordance with these Terms and Conditions only so long as you keep intact all copyright and proprietary notices. No right, title, or interest in the Content, downloaded materials, or software is transferred to you as a result of any downloading or copying of the Content. Except as expressly authorized by these Terms and Conditions, you may not reproduce, publish, transmit, distribute, display, modify, create derivative works from, sell or participate in any sale of or exploit in any way, in whole or in part, any of the Content without the prior written consent of Ruud. It is strictly prohibited to modify, transmit, distribute, reuse, reverse engineer, repost, "frame" or use the Content without written permission from an authorized representative of Ruud. THE PROGRAM INCLUDES CONTENT AND INFORMATION THAT IS SUBJECT TO CHANGE WITHOUT NOTICE. WHILE Ruud DESIRES THAT THE CONTENT AND INFORMATION AVAILABLE ON THE PROGRAM BE UP-TO-DATE AND ACCURATE, IT IS YOUR SOLE RESPONSIBILITY TO CONFIRM THE ACCURACY, COMPLETENESS OR RELIABILITY OF SUCH CONTENT AND INFORMATION. THE PROGRAM IS INTENDED SOLELY TO GIVE YOU INFORMATION RELATED TO Ruud PRODUCTS, BUT IS NOT INTENDED TO BE A SUBSTITUTE FOR YOUR PROFESSIONAL JUDGMENT. ACCORDINGLY, Ruud DOES NOT WARRANT OR MAKE ANY REPRESENTATION REGARDING THE USE OF THE CONTENT OR INFORMATION AVAILABLE ON THE PROGRAM OR THE ACCURACY OR RELIABILITY OF SUCH CONTENT OR INFORMATION. You are prohibited from violating or attempting to violate the security of the Program, including, without limitation, (a) accessing data not intended for such user or logging onto a server or an account which the user is not authorized to access; (b) attempting to probe, scan or test the vulnerability of a system or network or to breach security or authentication measures without proper authorization; (c) attempting to interfere with service to any user, host or network, including, without limitation, via means of submitting a virus to the Program, overloading, "flooding," "spamming," "mailbombing" or "crashing;"; or (d) forging any TCP/IP packet header or any part of the header information in any email or newsgroup posting. Violations of system or network security will result in the user being denied access to the Program and may result in civil or criminal liability. Ruud will use commercially reasonable efforts to investigate occurrences that may involve such violations and will cooperate with law enforcement authorities in prosecuting Program users who are involved in such violations. You agree not to use any device, software, or routine to interfere or attempt to interfere with the proper working of the Program or any activity being conducted on the Program. You agree not to use or attempt to use any engine, software, tool, agent or other device or mechanism (including without limitation browsers, spiders, robots, avatars, intelligent agents or similar devices) to navigate or search the Program. Any passwords used for the Program are only intended for individual use. You are prohibited from sharing or otherwise providing the right to use your password with any other person. You will be responsible for the security of your account and your password. Ruud may, in its sole discretion, monitor the use of any password and may require you to change your password at any time. Anything that you submit or post to the Program and/or provide Ruud in conjunction with your use of the Program, including without limitation, ideas, know-how, techniques, questions, answers, reviews, comments, and suggestions (collectively, "Submissions") is and will be treated as non-confidential and nonproprietary and will automatically become the sole and exclusive property of Ruud and may not be returned to you. You will not use false contact or log-in information or the information of any other person or entity, pretend to be someone other than yourself or otherwise mislead Ruud or third parties as to the origin of any Submissions. You agree not to post content that is illegal, obscene, threatening, defamatory, invasive of privacy, otherwise injurious to third parties. THE PROGRAM, INCLUDING, WITHOUT LIMITATION, ALL PRODUCTS, INFORMATION, CONTENT, AND SERVICES MADE AVAILABLE ON OR THROUGH THE PROGRAM, IS PROVIDED “AS IS.” Ruud AND ITS AFFILIATES AND THEIR EMPLOYEES AND AGENTS MAKE NO REPRESENTATIONS OR WARRANTIES OF ANY KIND OR NATURE WHATSOEVER REGARDING THE CONTENT OR SERVICES OF THE PROGRAM. Ruud AND ITS AFFILIATES AND THEIR EMPLOYEES AND AGENTS DISCLAIM ANY AND ALL EXPRESS OR IMPLIED CONDITIONS, REPRESENTATIONS, AND WARRANTIES, INCLUDING BUT NOT LIMITED TO WARRANTIES RELATED TO ANY COURSE OF DEALING, USAGE OR TRADE PRACTICE AND ANY IMPLIED WARRANTY OF MERCHANTABILITY, FITNESS FOR A PARTICULAR PURPOSE, TITLE OR NON-INFRINGEMENT. MOREOVER, Ruud DOES NOT REPRESENT OR WARRANT THAT YOUR ACCESS TO AND USE OF THE PROGRAM WILL BE UNINTERRUPTED OR ERROR-FREE, THAT DEFECTS WILL BE CORRECTED, OR THAT THE PROGRAM AND MATERIAL ACCESSIBLE TO YOU ARE FREE OF VIRUSES OR OTHER HARMFUL COMPONENTS. NEITHER Ruud NOR ITS AFFILIATES WILL BE LIABLE FOR ANY DIRECT, INDIRECT, INCIDENTAL, PUNITIVE, CONSEQUENTIAL, OR ANY OTHER DAMAGES WHATSOEVER THAT RESULT FROM THE USE OR PERFORMANCE OF, OR THE INABILITY TO USE, THE SITE, THE PRODUCTS, OR INFORMATION OR FUNCTIONS ON SUCH SITE, EVEN IF Ruud HAS BEEN ADVISED OF THE POSSIBILITY OF SUCH DAMAGES. IN NO EVENT WILL Ruud AND ITS AFFILIATES’ TOTAL LIABILITY TO YOU FOR ALL DAMAGES, LOSSES, AND CAUSES OF ACTION, WHETHER ARISING OUT OF CONTRACT, TORT OR OTHERWISE, EXCEED THE AMOUNT PAID BY YOU, IF ANY, FOR ACCESSING THE PROGRAM. In addition to any other legal or equitable remedies for misuse, Ruud may, without prior notice to you, immediately terminate these Terms and Conditions or revoke any or all of your rights granted under these Terms and Conditions. Upon any termination of these Terms and Conditions, you must immediately cease all access to and use of the Program and Ruud may, in addition to any other legal or equitable remedies, immediately revoke all password(s) and account identification issued to you and deny your access to and use of the Program in whole or in part. Any termination of these Terms and Conditions will not affect the respective rights and obligations (including without limitation, payment obligations) of the parties arising before the date of termination. You agree to defend, indemnify, and hold harmless Ruud and its affiliates from and against any and all claims, damages, costs, and expenses, including without limitation attorneys' fees, arising from or related to your use of the Program. The remedy of Ruud at law for any actual or threatened breach of these Terms and Conditions would be inadequate and Ruud will be entitled to specific performance or injunctive relief, or both, in addition to any damages that Ruud is legally entitled to recover, together with reasonable expenses of any form of dispute resolution, including, without limitation, attorneys' fees. No right or remedy of Ruud will be exclusive of any other, whether at law or in equity, including without limitation damages injunctive relief, attorneys' fees and expenses. No waiver by Ruud of its rights or remedies under these Terms and Conditions will imply any obligation to grant any similar, future, or other waiver. In making and performing these Terms and Conditions, the relationship between the parties is that of independent contractor and neither party will be deemed an agent, legal representative, joint venturer, or partner of the other party. You are not authorized to create or bind Ruud to any obligation, affirmation, or commitment with respect to any other person or entity. By using the Program, you agree that the laws of the state of Georgia, without regard to principles of conflict of laws, will govern these Terms and Conditions. Furthermore, you agree to submit to the venue and personal jurisdiction of the state and federal located in the state of Georgia for the resolution of any controversy or claim arising out of or relating to these Terms and Conditions or relating to use of the Program and you waive any objection to such jurisdiction on the grounds that it is an inconvenient forum or any similar grounds. Ruud specifically reserves all rights to limit provision of the Program to select persons, countries, or geographic regions. We have detected that your iPad operating system is out of date. Please connect your device to iTunes to update to the latest version. Once updated, you can return to MyRuud.com to download the app. If you're just trying to access MyRuud, click the button below and then login to MyRuud. Stay up to date with Rheem. The MyRheem.com Sales and Marketing Support Portal is a powerful, easy-to-use, full-featured portal that provides support for your sales, marketing and training needs. Don't have a MyRheem account? Are you looking to grow your business? MyRheem offers tools and resources to help you achieve your goals. Sign up for an account today! Forgot your password, click here. Forgot your username, click here. Receive news and updates from Rheem on a regular basis through bulletins, news feeds, blog postings and more. Quickly access valuable information and resources for the full line of Rheem heating, cooling and water heating products. Rheem has tools to help you succeed in promoting your business in print, broadcast, on the internet and beyond. Easily access warranty information for Rheem products, including product registration and warranty support.